Honey oak cabinets are one of the most common kitchen cabinets you will find…and today you might not be too happy to find them, lol! They are not the trend du jour, but that doesn’t mean you can’t have your cake and eat it, too. You can have an updated farmhouse style kitchen without having to either paint or get new cabinets. Wood tone cabinets also give a warmth to your kitchen you can’t get if everything is white, and another benefit, easier to keep clean….white cabinets show every little finger that touched them, lol! Also, chances are your oak cabinets are solid wood and not a veneer like many painted cabinets. I’m going to share with you some of the updates I made to completely change the look and feel of my kitchen. The first thing I addressed was very simple. Remove dated valances from kitchen windows. 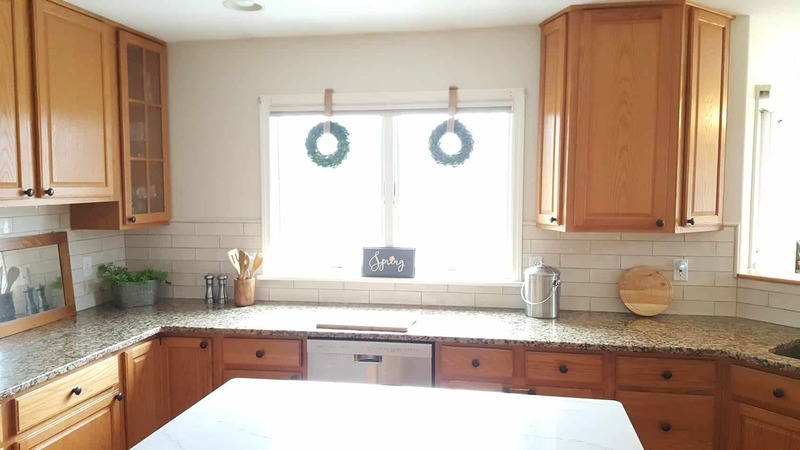 One of the easiest ways to start to introduce a farmhouse look to your kitchen is to incorporate wreaths over your windows. Faux boxwood wreaths are a great option. They do a lot to simplify the overall look of the kitchen, meaning they give an uncluttered look. I personally love burlap ribbon, so I chose that to secure my wreaths to the window frame. Again, I love a neutral color palette, so burlap always works well for me! You could choose to change the ribbon seasonally…my favorite RED VELVET RIBBON would be beautiful to use at Christmas time. Be sure to check out my FARMHOUSE RIBBON DIY TUTORIAL. Also, a simple Farmhouse Sign from one of my favorite ETSY SHOPS on your windowsill adds a lot of style without adding any counter clutter. I use mine as holiday decor changing the signs through the seasons. The one shown here is from my sister’s Etsy shop, Annie louise designs. She primarily makes leather earrings and bows, but also does some beautiful painted signs. There are some really easy ways to make a big impact on the look of your kitchen with some decor items. When you see white kitchens styled, what you will notice is wood tone accessories, for example there are often a series of wood cutting boards displayed. In a kitchen with wood tone cabinets, you already have the warmth from the wood, so you will want to focus at bringing in a few other materials. Some Galvanized Metal Decor Items with greenery, like Faux Boxwood will really begin to change the look in your kitchen. Another metal toned item I recommend is our Compost Bucket. (We compost daily, if this is not something you already do, please be sure to subscribe to our blog, as we are working on some great content for you on how to get started with composting and you can get it sent to your inbox when it is published. We’ll break it down for you to make it really easy, so you can be successful getting some valuable material for your garden.) One of the wood items you see is a Personalized Cheese Board. These are great to display and also make great gifts! In our breakfast nook, you will see a stained wood board sign. I wanted to make this to add some texture and interest to the lightness of the walls in that area. We custom designed the dimensions to fit in the narrow space above our window. We have a how-to to show you exactly how to make these signs in various dimensions using only simple hand tools, so be sure to check that out. Finally, a very simple way to ‘farmhouse up’ your sink area is with Mrs. Meyer’s soap & cleaning products. Their labels are the perfect look to go with that style. You can use my link to get a gift set with your first order and a trial in the Grove Collaborative program. You can try it out and if it’s not for you, you can cancel at any time. You can see more about which products I have and love in my Grove Collaborative Review. Below you can see a peek into our playroom that we recently updated, as well. Check out my DIY on how to make Farmhouse Style Poster Frames. Since you have decided that you are not painting your oak cabinets, what can you do to update their look? Take a look at your hardware. Updating this can be an easy & inexpensive way to give them a facelift. Our cabinets had simple black drawer knobs, which I like, so I did not change those. If your kitchen has shiny brass, silver tone or another hardware style, consider these BLACK DRAWER PULLS, that are under $20 for 10! This will make a big change with very little money! All my cabinets and drawers have round knobs, so I am considering switch the drawers to this style pulls. This article shows a beautiful update to the hardware on oak cabinets with a dramatic result. I settled on Neutral Ground. I actually also used Canvas Tan, one of the other colors they recommended in another room, our office. Before you settle on a color, always take a look at the lighting in your room, especially at different times of the day. Neutral ground really changed during the day in my house…on some walls during the day it can read as a really, really light grey tone, while on other walls during the day, it really looks white. Our kitchen has minimal wall space that is painted, so using such a light color works, but in a room with a lot of wall space to paint, it might feel too light, so it is always worth checking with at least a couple swatches first. One of the most dramatic updates you can make to the overall appearance of your kitchen is to add a backsplash. And, if you are a lover of farmhouse style…you know that means SUBWAY TILE. I knew I wanted to go in this direction, but I knew I didn’t want the traditional 3 x 6 flat subway tiles. I wanted a 3 x 12 tile. I think the 3 x 12 tile give an elegance to the room, with less grout lines, you get an overall more simple, less busy look, especially if you plan to use a contrasting grout color. I also wanted tile that had some texture to it. This adds so much to the overall look, I really love this style. It looks handmade, which gives it a beautiful finish to your walls. But, my favorite thing that it does is it gives a lot of light play and reflection that you can’t get with a flat tile. At the time I was searching for tile, I had a terrible time finding what I was looking for…a 3 x 12 subway tile, w/ a textured face, and a cream tone. I did not want a white tile, I wanted a softer tone to the room and one that complements a wood tone cabinet. 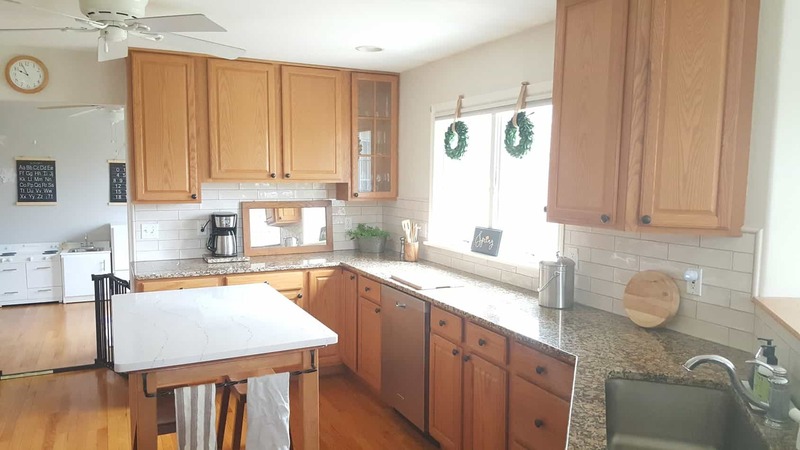 If you are going to do a subway tile backsplash with wood cabinets, I really recommend taking a look at some samples of white versus cream to see the difference of how that work next to the wood. I eventually was able to find exactly what I was looking for from TILEBAR. I can’t say enough about the service I got from them. Their shipping was very fast, which I really appreciated because right before starting the project my contractor, David A. Wible Contracting, recommended a pencil trim (I am so glad I did, it gives a beautiful, simple finished look. ), so I had to order it as the project started and it came within just a couple days! Whew!! Crisis averted! I have also emailed them with some questions and have gotten prompt replies to assist me, which I really appreciate from a company. The tile I chose is LANCASTER VANILLA. It is just beautiful!!! I highly recommend checking it out! When designing your backsplash, one of the most difficult decisions can be what color grout to use. I actually ended up making a last minute change to my plan. Initially, I thought I would go with white grout, since my goal was a simple, uncluttered, clean look. But, when the tile was installed, I found I really liked the way it looked without the grout…which was a darker look in the areas to be grouted. I was totally unprepared to on a whim go searching for grout colors, but I am so glad I did. I ended up picking a grout color called ‘oyster grey’, a light grey shade. It kept the light look I wanted, but gave the contrast I found I really liked, too. what I did do to update the look was to add a quartz top to our center island. I wanted something that would not compete with the business of the granite and wanted something light and with a small amount of horizontal veining. I searched local countertop stores in my area and found what I was looking for with Cambria Ella from Down East Granite. I ordered a remnant piece with a little overhang on each side from the original top to the table and all that was involved in installing was to do a light sanding on the table top and then use some silicone caulking to secure it in place. It really was a very easy DIY! The biggest tip I have for you with a project like this is to shop around!!! I was quoted prices more than 3 times the amount I ended up paying and that was even for a lesser quality surface material. It is definitely worth putting in a little time to call and look around before purchasing solid surface countertops. Although I didn’t paint our cabinets, I did paint our dining table in our breakfast nook. It was a generic dark stained table that I wanted to lighten up to coordinate with the new look in our kitchen. To start, I did a light sanding of that table and chairs and then wiped it down with a damp microfiber cloth. Next, I painted everything with a Bonding Primer. It is worth taking this extra step on something like a dining table that will get heavy use to help get the best adhesion of your paint. I then painted two coats of Olympic One Paint. I used SW 6385 Dover White on the table base and chairs. This white works great in the lighting in my breakfast nook and great room, but be sure to check it out in your space…whites will show very different in different lighting. This one has quite a bit of yellow in it, but in my lighting the yellow does not show. For the table top, I used SW 7019 Gauntlet Grey and it worked perfectly. I wanted a grey that was darker and had almost a slate look to it. I used a satin finish. This biggest tip I can give with painting furniture is do not over brush. Get the paint on and let it go, it will flatten out itself as it dries. When you keep brushing over what you already painted, you will have a tendency to remove paint from the surface and end up brushing ridges into the finish, which you do not want. These chairs were a bit of a handful to paint, to be honest…so many nooks and crannies to try to get into. I ended up using a foam brush on the chair backs, which worked better than a bristle brush for that job. How pretty are those flowers?!?! They are all from our native plant garden!! We have some great articles and videos to share our love of native plant gardening, so be sure to head to our NATIVE PLANT page and our GARDENING TIPS page. It has been a lot of fun working on our kitchen, the most recent thing we got done was the quartz island top. I originally thought I would want to paint the wood on the island base, but once the quartz was on, I really like it as-is. I think it ties it together nicely with the cabinets….but, who knows…give me a few more months and maybe I’ll want to change it up. One more thing on my to-do list as far as painting in the kitchen is to paint our stools for the island. They are dark stained wood like the dining table used to be, so now they do not coordinate with anything. My plan is to paint the stools the grey color like the dining table top. Be sure to check back for an update to this article when I get those done. Thanks for reading. I look forward to hearing about your kitchen updates! Be sure to comment and let me know what changes you try! This article contains affiliate links for Amazon, Etsy, & may contain affiliate links for Tilebar. This means when you purchase an item through our link, we can earn a small commission from those retailers at no cost to you. This helps to support our website, thank you for shopping our links! Everything looks great! You give some really good tips here! Thank you so much, Shannon!!! We really appreciate you taking the time to check out our latest post and to leave a comment! We are looking forward to following your next season with Crimson Clover Flower Farm!! Happy New Year!